Double bassist Stefano Scodanibbio was a superlatively inspirational figure not only in the world of the double bass, but in the larger world of new music as well. Even three years after his premature death of ALS this sense of inspiration hasn’t dissipated but rather continues to come through whether in the work being done by those directly influenced by his example—the fine Norwegian bassist Hakon Thelin comes immediately to mind—or in the underlying warmth that seems to pervade the recordings of his encounters with other musicians. The present set of duets and trios spanning 1996-2008, put together by Massimo Simonini in accordance with Scodanibbio’s wishes, provides unmistakable evidence of the musical charisma the bassist could summon in intimate settings. Although Scodanibbio was known above nearly all else as a masterful interpreter of new, often very difficult works by contemporary composers—think of his adaptation for the double bass of Luciano Berio’s Sequenza XIV for cello; his realization of works written for him by Iannis Xenakis, Luigi Nono, Brian Ferneyhough and others; and his transcription and performance of Cage’s notorious Freeman Etudes. (Speaking of Cage, the composer was on record as maintaining that Scodanibbio was the definitive interpreter of Ryoanji on double bass—no small praise, as Cage could express dissatisfaction with what he considered performers’ taking undue license in the handling of that piece.) “Nearly all else,” because he was perhaps foremost as an improviser, albeit an improviser with a strongly innate compositional sense who was adept at creating coherent structures in the moment, with whomever happened to share that moment with him. This essential aspect of his playing stands at the core of these exhilarating performances. 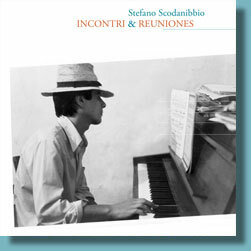 On all seventeen of these tracks, Scodanibbio’s ear for composition reveals itself in his choices of timbres and in the instinctively contrapuntal phrasing he layered under or over another player’s line. Both of these qualities were two sides of the same coin; his timbral choices served to create complements to or contrasts with their surroundings, depending on the desired effect, while his sense of phrasing was one that encompassed a unity made up of equal parts pitch and timbre. His trademark integration of harmonics at all points on the instrument with conventional notes allowed him to create highly organic, often lyrical phrases of sharply contrasting timbres. The majority of the duets in this collection are for strings: Ten for double bass and cello, and one for double bass and viola. This latter, a 2006 encounter with Garth Knox, allows Scodanibbio to elaborate on the methods of real-time composition he developed to a fine degree—the construction of solid textures and cohesive melodies out of the shimmering, ghostly sounds of harmonics and sul ponticello bowing. The contrast of these sounds, at once keen-edged and robust, with Knox’s pointed pizzicato playing is particularly memorable. The eight brief duets recorded in 2008 with cellist Rohan de Saram—who played on Scodanibbio’s Six Duos CD of 2001—explore a quite different realm of sounds. Here the emphasis is on pure color, with both instruments seeming to decompose into their constituent raw materials. Scodanibbio’s duet with cellist Tristan Honsiger, recorded in Honsiger’s home in 2002, starts out in a similar manner—a woody, rattling flourish of pizzicato and strikes with the wood of the bow—but its stabs and arco swoops mutate into the CD’s closest approach to conventional counterpoint for strings, with Scodanibbio undergirding Honsiger’s hyperkinetic melodies. Scodanibbio’s playing could at times take on the character of the sarangi, the cello-like North Indian instrument often used to accompany vocal performances. Terry Riley, represented here playing Korg Triton synthesizer on a duet recorded in Granada, Spain in 2000, found this dimension of the bassist’s sound attractive. The two recorded a CD together of modally-inflected music in just intonation; the Granada improvisation continues in a similar vein. Scodanibbio provides a percussion-like propulsion to the music, bouncing the bow off the strings to produce a skipping tango-ish or vaguely Middle Eastern rhythm. A 2005 duet with cellist Frances-Marie Uitti, whose unique style of play involves the use of two bows at once, extends the North Indian flavor by starting with a tamboura-like drone, which forms the basis for a gradual move into changing chords supporting a somber lyricism. The disc is rounded out with three trios for double bass, trombone and percussion, and two pairings with soprano saxophonist Bruce Ackley. The duets with Ackely, recorded in 1996 in Oakland, make good use of dynamic variations and draw on Scodanibbio’s ability to use bow articulations to mimic the sound of the wind instrument, which Ackley puts through a program of trills, whistles, multiphonics and runs. On the three trio improvisations recorded in concert in Parma with trombonist Mike Svoboda and percussionist Michael Kiedaisch in 2004, Scodanibbio’s contrapuntal playing takes on a rhythmic character. Instead of weaving countermelodies around Svoboda’s shouts and whispers, he plucks, strikes and taps in the spaces Kiedaisch opens up along the way. Some kind of tension, real or metaphorical, is primary for the life force of any music. La Monte Young’s music can have lots of tension with very few notes, and the performance of one of his early pieces at Dia: Chelsea’s “Dream House” on Friday had it in every aspect of its experience. The artists ran the gamut, from the funk-pop of Snarky Puppy to the resolute avant-garde of alto saxophonist Matana Roberts. And among the emerging acts were a few ringers, like bassist Christian McBride, now 43, who’s been a star for a couple of decades, and the long-esteemed New Orleans drummer Herlin Riley.